A High Weed Mower is typically rented when homeowners allow their grass to grow too tall for a regular mower to cut without getting bogged-down. 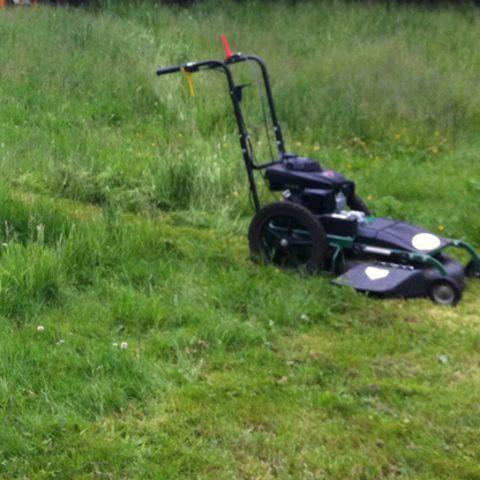 The High Weed Mower can quickly mow through waist-high weeds and grass. In the Pacific Northwest, it's amazing how fast our yards can become too much for a standard 21 inch mower to manage. Some homeowners with large yards choose to rent the High Weed Mower monthly because it's cheaper and easier than maintaining a smaller mower that would take much longer to use. I can certainly relate. My old home in North Portland had a 50 x 75 foot back yard. It took me about an hour to mow all of it on a good day. If I let it go one week too long then it would take 2 hours or more. If I let it go 2 weeks too long then I could never get through it with a standard, self-propelled, mower. The funny thing about overgrown grass is that even when you think it's dry and easy to cut (because you're looking down from the top), it's still moist or wet down where the mower blade is running. This makes it even more difficult for a standard mower. In the Portland, OR area, unless it's late summer, it's nearly impossible for long grass to completely dry enough for cutting. There is nothing worse than mowing 4 feet of yard then stalling out the mower engine and having to restart it. The High Weed Mower eliminates all of this frustration. Wet or dry, it has enough power to cut through. Since the cutting deck can be lowered to 2" off the ground, it can also be used for finish mowing. I always recommend that people try to mow their tall grass down 2" inches so they don't have to worry about mowing it again. After all, there is a reason the grass grew that high in the first place. Usually it's because homeowners are too busy to be bothered by their yards. Work, family and life take priority over a yard, and when life get's chaotic for long periods of time, then it's time for the high weed mower.